Over the weekend me and Joe had a relaxing Sunday wandering around Russell Square and then headed down to South Bank. If you haven't been to South Bank before I would recommend it for the art galleries but at this time of year it's also great for the Christmas markets. One of favourite places to visit at any time of year is a book stall underneath Waterloo bridge near the National Theatre. It always has a variety of books but the best thing about this stall are the maps they sell. I am a sucker for detailed maps and this stall has so many maps ranging from the London boroughs to ones from around the world. Of course I had to check if they had Manchester maps available which they did! It was so bloody cold on Sunday so I really appreciated this teddy bear coat in this crisp winters day in London. I honestly don't mind the coldness when you have a pretty coat like this to wear. 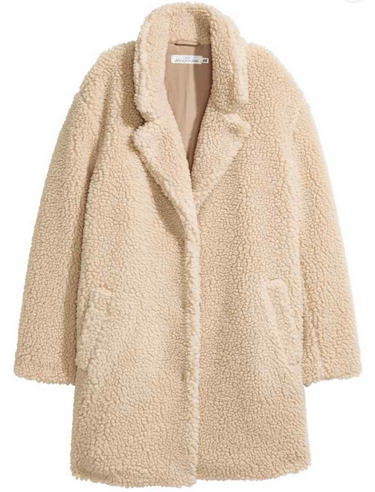 It's been a great edition to my coat collection, seamlessly fitting with any outfit I wear it with. I'm just trying not to wear it too much so I don't get bored of it! Here I have fully embraced the camel colour trend and mixed different textures to create this winter warming look. All of these pieces have been worn separately but who knew that the camel coloured knit and coat would sit so well together! As always I've added some contrast pieces with these white woven trousers. White is not always the most practical colour for winter but sure looks good against the camel and black boots. I really love this look, in fact its up there as one of my favourite outfits for this year! Who knew that that double camel colour would look so good together. Sometimes I surprise myself! This no denim challenge has definitely made me consider my clothing pieces when putting my looks together. Anyway I would love to know your thoughts on this look?